Timelines are often used for presenting events in a chronological order or demonstrating the stages of a particular process. The Internet is full of free tools that offer great and fancy features for timeline creation. Which ones are the best though? In this article, I’ll share the top 10 free timeline creation tools for teachers. Timelines are an inarguably powerful visual tool that is widely used for educational purposes. You can use it to put emphasis on important aspects of a work process, explain it or present progress stages chronologically. Teachers often reap the benefits of timeline integration in their lessons. Timelines add to a lesson’s interactivity and enable teachers to showcase how a concept has changed over time. So, let’s take a closer look at some of the best free timeline creation tools out there. One of the most professional looking free timeline creation tools on the Internet that you can also use to produce milestones and Gannt charts. With its Powerpoint built-in feature it enables you to craft timelines and directly incorporate them into your Powerpoint slides. Office Timeline allows you to import files from Excel or Project Management tools like Microsoft Project, if you pay for a premium subscription. It offers great space for customization and full modification of your designs to localize them for any audience. Although it might seem odd for such a professional looking platform, it does come with a free version available for download. However, for $49 per year for individuals and $59 per year for businesses you get the Plus Edition. Features include import & sync from Excel, pre-built templates and various milestone and task shapes. Particularly useful in the presentation of historical data or the succession of a series of events describing a specific era. Craft great timelines and share them directly with your network of friends on various social media such as Facebook, Pinterest, Twitter and Google Plus. Sutori allows users to include audio and video files in their timelines for a more engaging and interactive experience. You can contact the company directly and find out how you can customize various features to cater to the educational needs of your lessons and what pricing options you have. Using MyHistro you are one click away from sharing all your meticulously put together timelines with your social media network on platforms like Facebook and Twitter. Busy iPhone users are also able to use MyHistro to create timelines on the go. You get to use all of MyHistro's great features for free. OurStory is mostly targeted towards personal use. However, this is one of the most functional free timeline creation tools that can certainly get the job done for teachers, if they are not in need of something too fancy. Users can interact in the comments section or share their creations on social media networks. Text, images, video comprise timelines that are interesting, descriptive and engaging. Tag other people and go beyond personal timelines into making collaborative stories. Incorporate timelines into your lessons completely free of charge. Cnet gave this timeline maker a 5-star rating and with good reason. This is definitely one of the most efficient free timeline creation tools to be considered by teachers. Great abundance in template variety to suit your students’ needs. SmartDraw automatically realigns events every time you make changes to your timelines. All you have to do is provide the information. If you’re a Windows user you can download the platform on your PC for ease of use. However, there is an online edition for use on computers and tablet devices as well. With just one click you can integrate your timelines into MS Word or Powerpoint. With Smart Draw’s free 7-day trial you can see what all the fuss is about completely free of charge. The Standard package gets you a Cloud service and 40+ visuals for $197 per year. The Business package offers an additional 70+ business visuals for $297 per year. For $497 per year you can purchase the Enterprise package that offers all the previous features along with Project Management tools and Sharepoint integration. Social media and social learning are widely used by both teachers and students, so why not use probably the best free timeline creation tool for Twitter out there? Do you use Twitter as a tool in your lessons? Twitter Custom Timelines gives you the chance to craft a timeline of all tweets on a particular subject and showcase your students how their grasp of a subject has changed over time. Twitter Custom Timelines enables students to share their timelines on Twitter or embed them on their website. Twitter Custom Timelines is an entirely free timeline creation tool. Open-source timeline maker with lots of different features and highly regarded as one of the most interactive free timeline creation tools. You don’t have to be an expert as Timeline JS has you covered with some pre-made templates. However, more advanced users can go into further customizations to create more impressive timelines. Users can incorporate media from a wide variety of sources such as Twitter, Flickr, YouTube, Vimeo, Vine, Dailymotion, Google Maps, Wikipedia, SoundCloud, Document Cloud and many more. Teachers can eliminate all space barriers by making use of this tool for multi-lingual projects. Timeline JS offers all of its great features for free. This platform’s name is pretty indicative of what it offers as it is one of the truly functional free timeline creation tools. This timeline maker does not require any registrations. Drag and drop features make timeline creation a breeze. Free Timeline can be easily utilized from any desktop or tablet device. Excel and Google Sheets CSV files can be directly imported into Free Timeline. Much like the name of the platform suggests, no subscriptions are required. TimeGlider has some very interesting features that make it one of the most distinctive free timeline creation tools on the Internet. The company calls it “Google Maps but for time” and they are right. Zooming in allows you to further focus on parts of the timeline where many events are accumulated and must be emphasized. Specify the importance of the event and make it prominent on the timeline. Unique timeline URLs give you the chance to share it on social media or embed it to a website. Students can use the platform for free. However, for $5 per month or $50 per year you can purchase the basic package that allows you to use 200 hosted images, tagging and batch editing. The Group package allows use of the platform by 5 different users, 4000 hosted images as well as the super user feature. Another highly effective free timeline creation tool that gets the job done well. It doesn’t have too many fancy features, so if your lesson is in need of basic designs, then look no further. It doesn’t get any simpler than that, but truth is, it works. No sophisticated features are available here. Students can easily share their creations on Facebook, Twitter, Pinterest and Google Plus or embed them on any website. This easy-to-use timeline creation tool is entirely free. Timelines are essential for teachers as they make content easy to follow and memorable. 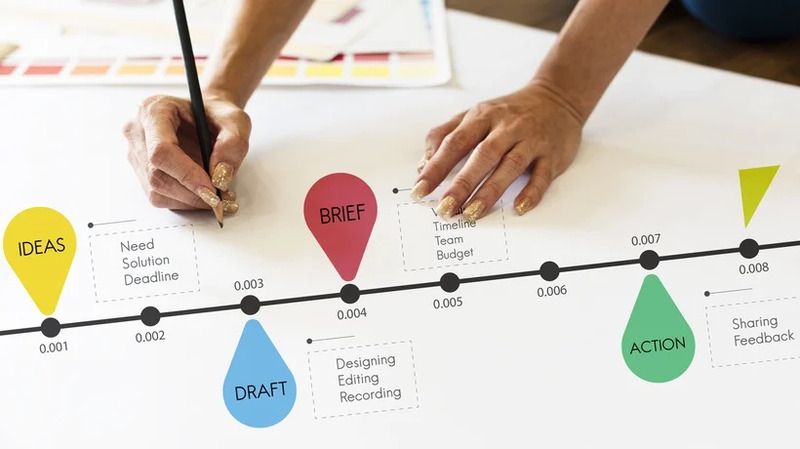 These 10 free timeline creation tools can help you generate both basic and sophisticated timelines depending on your lesson’s needs. Free timeline creation tools are a powerful tool for teachers. When used creatively they can contribute significantly to the comprehension of a subject without any extra expenses. Read the article 10 Creative Ways To Use Free Timeline Makers in eLearning and learn how you can use free timeline makers to produce compelling eLearning courses.